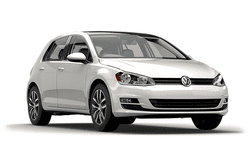 The Volkswagen Golf is refined and comfortable, making it a popular option for car rentals in the area. It comes with the features you want and need without all the excess that just seems to get in the way. But it still remains fun to drive and is a very popular model in the Volkswagen brand. The cabin is classy and practical, while also being comfortable and inviting. With sets for 5 and a good cargo area, you can fit the entire family or work team and get to wherever you need to go in style and comfort. Make your reservation today and see for yourself what the Volkswagen Golf has to offer you and how the combination of refined luxury and proven comfort perfectly bend into one amazing vehicle!